Three monogenean taxa (Hargicola oligoplites, Mazocraes sp., and Neohexostoma euthynni) are recorded for marine fishes from the Gulf of Nicoya, Costa Rica. Two of them (Mazocraes sp. and N. euthynni) represent new records for the helminth fauna of Costa Rica. AGUILAR-AGUILAR, Rogelio et al. NEW RECORDS FOR THREE SPECIES OF MONOGENEANS (PLATYHELMINTHES) OF MARINE FISHES IN THE GULF OF NICOYA, COSTA RICA. Boletín de la Sociedad Zoológica del Uruguay, [S.l. ], v. 27, n. 1, p. 7-10, july 2018. ISSN 2393-6940. 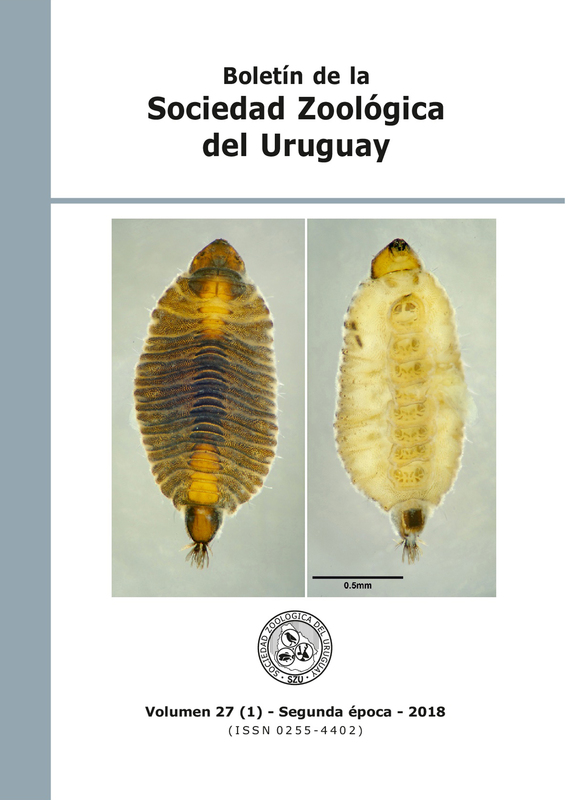 Available at: <http://szu.org.uy/journal/index.php/Bol_SZU/article/view/42>. Date accessed: 25 apr. 2019. doi: https://doi.org/10.26462/27.1.3.